I really tried to live with a neutral bedroom but mama needs a little color in her life! 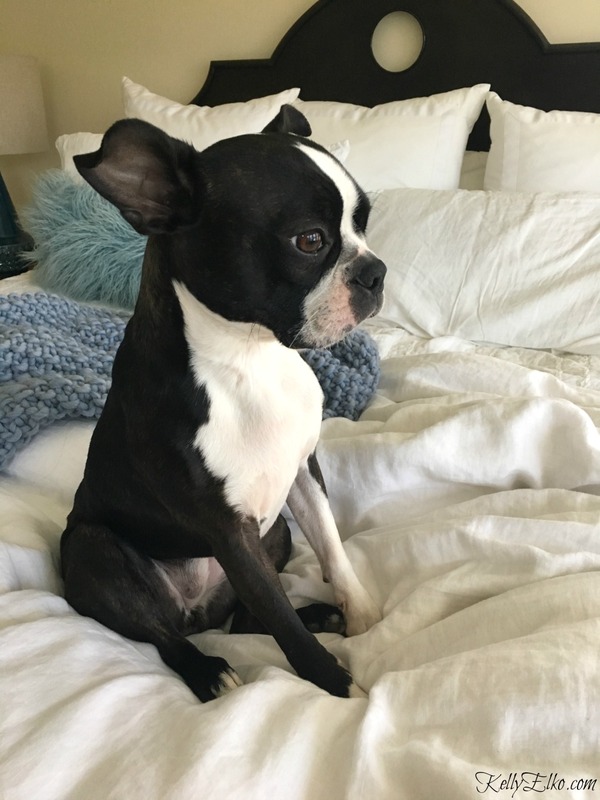 I love my white bedding and adding pops of color with pillows and throws but something was missing in my life. When I spotted these blue lamps with a mid century shape, I knew I had to have them (and gift them to myself for my birthday). They are the statement jewelry, the lipstick, the bling, the finishing touch this room needed. (P.S. if you’re my friend, you’ll ignore the missing pulls on my 20+ year old nightstand)! I asked a friend what she thought and she loved them but asked me if I would get tired of them. I told her I probably would eventually but since I couldn’t get these lamps out of my head, I knew I had to have them. I am not going to worry that I will tire of them in years to come – I want to enjoy them now! The best part is their size. They are tall – perfect for reading in bed (my other lamps always seemed a bit too squat). I did make sure to measure before I ordered since these lamps are on clearance and not returnable. (P.S. you also need to ignore the dust bunnies)! These are my absolute favorite lamps ever! I love the texture and the variations in color from light to darker blue. They really pop against my neutral walls and rug. A few blue accessories tie everything together but I want to have more fun mixing different colors. I tried being completely neutral but I guess my bedroom wants to be the lady in blue while everyone else is wearing tan. This is a case of go with your gut and if you can’t get something out of your mind, it’s probably a good idea to get it. Money Saving Tip: When I bought my sectional sofa (read all about it here), I opened up a credit card account and earned a credit back with my purchase – which I used to buy these lamps. It’s a great idea if you are buying a big ticket item – you can always close the card once you’re done. Best Lamps Ever! The pair sure do look like Aldo Londi for Bitossi, Great score! 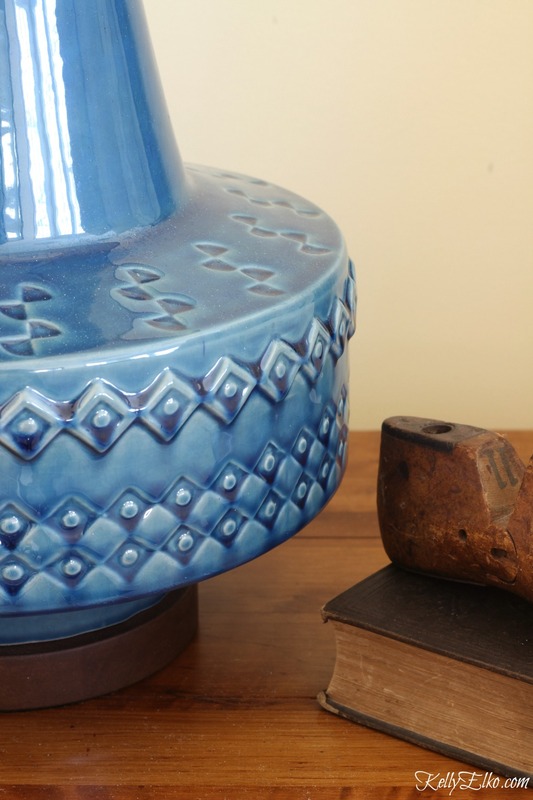 Thanks Sandra – you know your vintage lamps! I totally agree about color. 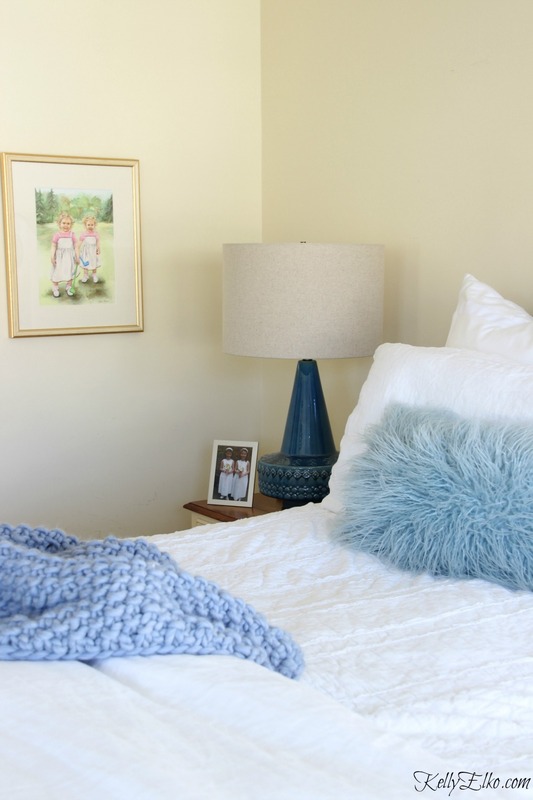 When I re-did my guest room, I thought I’d do it in various shades of white. That notion lasted a few days – just couldn’t do it! We tried Lyn – but we know ourselves and color rules! I really like your lamp. Beautiful job, very well done. I love your lamps! You won’t tire of them! Nice and it does add a pop of color. I like bold colors and use a lot of it in my house, so, naturally, I really, really like your lamps. I see why you were attracted to them. The shape is different and looks good on your night stand. 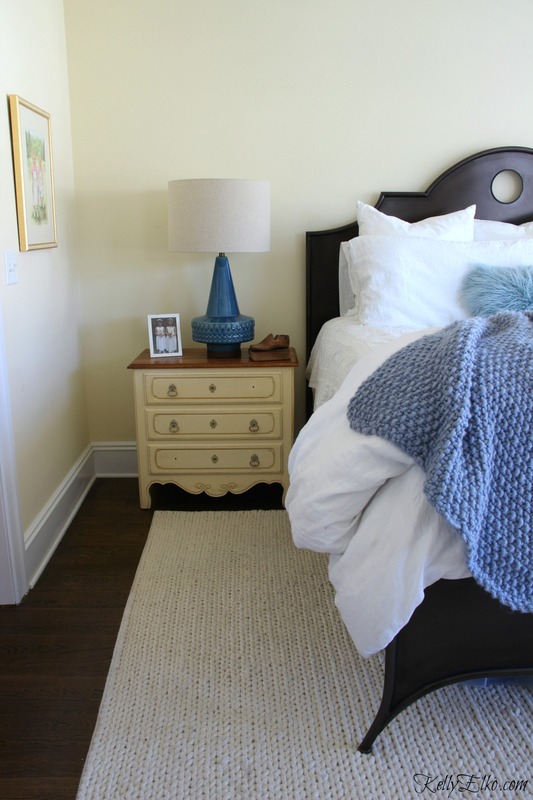 LOVE the lamps!….While I am enjoying my “almost all white” bed … I do love adding pops of color. Love the pops of blue in the room! … and Sushi makes a great addition too! I’m with you – I must have color! My house looks like a skittles bag. Ok, that’s probably extreme. 🙂 Very pretty lamps! That lamb is a gorgeous piece! I can’t imagine ever getting tired of it. I can see why you couldn’t get it out of your head. Also, I feel obligated to say this but.. canceling credit cards negatively affects your credit standing. So I wouldn’t use that method too frequently. Just what your room needed,I love them they go perfectly together. I know what you mean. I’m the same way. Gotta have some color. LOVE that lamp!!! I do like the colors of this room! Would you let me know the paint color of the walls? Thank you. I loved this post because my favorite color is blue! 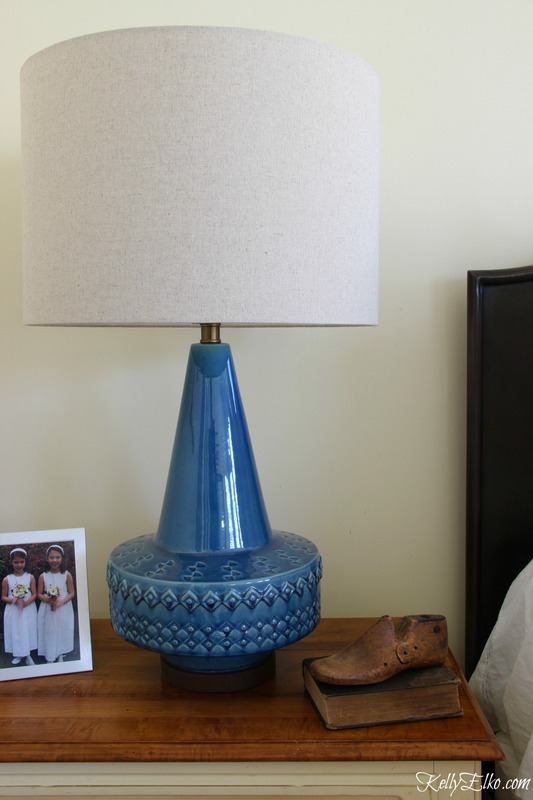 I just bought some bahama blue color sheets and thanks to your Bedroom Updates – Wrinkles and All post I got the idea to use gold lamps similar to the one you had. You give the best ideas, thanks for sharing Kelly!